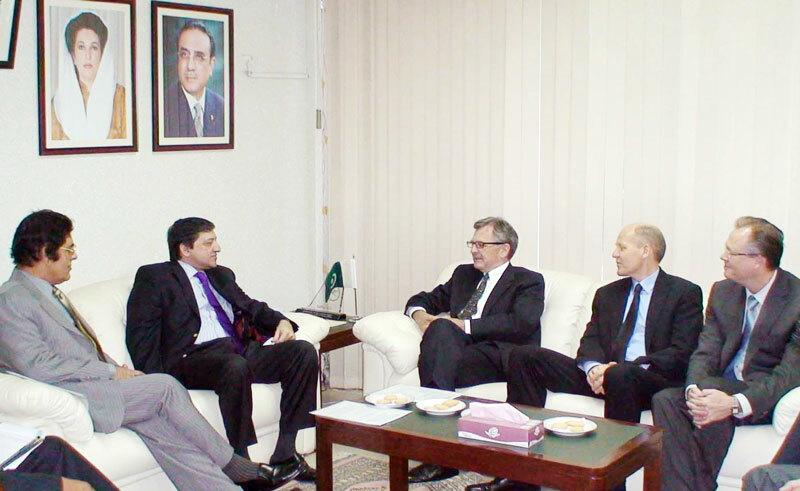 Mr. Saleem H. Mandviwalla, Minister of State / Chairman, Board of Investment (BOI) in a meeting with Telenor Delegation, headed by Mr. Harald Norvik, Chairman Telenor Group. Mr. Saleem H. Mandviwalla, Minister of State / Chairman, Board of Investment (BOI) held a detailed and interactive session with a 5 member delegation of Telenor Group which was headed by Mr. Harald Norvik, Chairman Telenor Group. Senior management of Telenor including Mr. Sigve Brekke, Head of Asia, Telenor Group, Mr. Jon Eddy Abdullah, CEO Telenor Pakistan and Mr. Aamir Ibrahim, Vice President, Strategy and Corporate Affairs Division, Telenor Pakistan. Mr. Mandviwalla noted that Telenor is now a flagship company of Pakistan which has captured a sizable market share within a very short period of time through their operations in the country, and lauded Telenor Group for recognizing the potential in the cellular market of Pakistan and investing a significant amount of US$ 2 billion in this sector. The delegation called on Chairman BOI to discuss various issues regarding the current tax rate situation in Pakistan. Telenor Group argued that the current GST for telecom companies is higher than any other sector amounting to 19.5% and an introduction of value added tax (VAT) in this sector would reduce this rate and help telecom companies in the country to focus in other areas of investment. Mr. Ibrahim mentioned that currently telecom sectors contribute approximately Rs. 120 billion in advance tax and GST to the Government of Pakistan. He also stated that just recently the Cabinet resolved the Access Promotion Contribution (APC) issue and have allowed a 2-2.5 cent APC which is still less than 5 cents which is provided to PTCL even though most access has been given by cellular companies in the country. Most people do not even have a landline to their name and are solely dependent on their cellular phones. Mr. Abdullah noted that the decision on APC will allow Telenor to reinvest and help them to focus on expansion in untapped areas and municipalities in Pakistan. He further mentioned that currently only 30-40% of areas are covered in Pakistan and currently 60-70% population is a subscribed with a cellular network. Therefore there is a tremendous opportunity to introduce cellular services in remote areas of Pakistan. The noted that Balochistan proposes a tremendous opportunity, if the Government can provide adequate facilities and security to telecom companies in the province. Mr. Bekke noted that the only way the telecom industry will achieve further growth is if telecom companies and the Government work in tandem. The notion that the telecom sector is stagnant was negated by CEO Pakistan, and he stated that there is still room for expansion in Pakistan and Telenor sees a growth potential of 15-20 million customers to its existing customer base of 95 million. Mr. Abdullah also noted that since their establishment in Pakistan, Telenor has not repatriated a single dollar as they believe in a long term investment perspective and have reinvested all their earnings back in to Telenor Pakistan. He praised the working of the Universal Service Fund (USF) and how it has helped to streamline bidding processes for broadband, fiber and GSM contracts for under served and un-served areas of Pakistan. In the end Mr. Norvick appreciated the Board of Investment’s guidance and assistance during their set up and throughout their tenure in Pakistan. He stated that the meeting and productive discussion at the Board of Investment has provided him with an increased understanding about the investment climate in Pakistan and some of the challenges such as inflation, energy shortages and specifically taxation regime. He reiterated Telenor Group’s strong commitment to Pakistan and in the development of the Pakistani telecommunications industry for the good of the Pakistani people. He also stated that he was impressed with the results that Telenor Pakistan has delivered and is also one of the best performing companies within Telenor Group itself. Mr. Norvick stated that this was due to the presence of a dedicated management and a skilled workforce that has made their Pakistani operation world class. Mr. Saleem H. Mandviwalla assured the Telenor Group that they will voice their concerns of taxation with the concerned authorities and facilitate and assist them in every possible way. He praised Telenor’s commitment in Pakistan and appreciated their expansion plans in the country.